First Spouse 1/2 oz Gold Coin. Quarter - State Territory Sets. 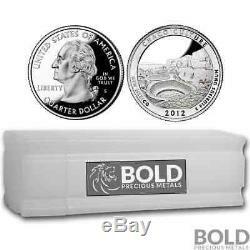 2012-S Silver Proof ATB Quarter Roll (40 Coins) - CHACO CULTURE. 2012-S 90% Proof Silver Chaco Culture America The Beautiful Quarter. You will receive the 90% proof silver America the Beautiful'ATB' quarter in a plastic flip. These coins were minted at the San Francisco mint. A complete roll of (40) 90% Silver Proof ATB Quarters will contain a total of 7.2336 oz of silver bullion. All of these coins were pulled from sealed US Mint silver proof sets and extreme care was taken not to touch or contaminate the 90% Proof Silver quarter in any way. To preserve their condition, these coins were placed in a plastic tube holder and were extracted from the original slabs using cotton gloves. These coins were only inspected to verify the year and count. They were not inspected to cull for cameos, deep cameos, variations, toned coins or mint errors. Expect to receive a mix of mostly gem proofs and a few toned/discolored/tarnished coins. The roll was comprised of a random inventory of 40 silver ATB quarter slabs and thus that is what you will receive. The older the coins, the more likely it is to receive toned/discolored or tarnished coins. The photo attached to this listing is a stock photo, but a representation as to what you will receive. ATB National Park Quarter Program. The America the Beautiful Quarters Program of the United States Mint is a multi-year initiative to honor 56 national parks and other national sites in each state, the District of Columbia and U. Under this program, each year beginning in 2010 and through 2021, five new reverse designs will appear on the quarter-dollar. The coins will be issued in the order in which the featured site was first established as a national park or site. Each coin in the series features a common obverse (head side), with the 1932 portrait of George Washington by John Flanagan, restored to bring out subtle details and the beauty of the original model. Former Secretary of the Treasury, Timothy Geithner, selected the list of sites to be honored after consulting with the governor (or other chief executive of each host jurisdiction) and former Secretary of the Interior, Kenneth Salazar, in accordance with authorizing legislation and the site selection process. ATB National Park Silver Bullion Quarters. The United States Mint is also minting and issuing unique silver bullion coins that are duplicates of each of the America the Beautiful Quarters. The bullion coins are made of. 999 fine silver, have a diameter of three inches and weigh five ounces. The fineness and weight are edge-incused on the bullion coins. The United States Mint is issuing these coins under the America the Beautiful Silver Bullion Coin? The item "2012-S Silver Proof ATB Quarter Roll (40 Coins) CHACO CULTURE" is in sale since Tuesday, September 19, 2017. This item is in the category "Coins & Paper Money\Coins\ US\Quarters\State Quarters (1999-2008)". The seller is "boldpreciousmetals" and is located in Austin, Texas.